“Winter” has arrived in Key West, which means temperatures in the 70s and envious texts from northern friends. 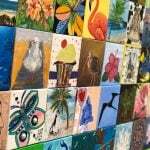 And Florida Keys residents are busy spreading holiday cheer and supporting local charities. One resident who towered above the rest in his 2018 fundraising efforts is Larry Blackburn. Standing six feet and seven inches tall, Larry is hard to miss as he travels around the island taking pictures for his renowned photography business. One of the most personable people I know, he always greets friends with a hug and a big smile. 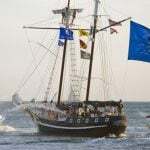 This year Larry participated in the Fantasy Fest royal campaign, which has been held each fall since 1989. Fantasy Fest, for those who don’t know, is the island’s outrageous 10-day costuming and masking festival that takes place in October. In August the candidates for festival king and queen are introduced, and then the royal showdown begins. The candidates are local men and women who volunteer to host events around Key West to raise funds for A.H. of Monroe County, previously known as AIDS Help (FYI, more than $4.5 million has been raised since the campaign’s inception). 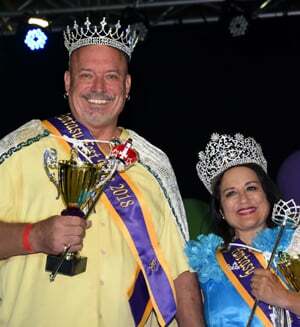 Each year, the royal hopefuls who raise the most money are crowned king and queen of Fantasy Fest at the Coronation Ball — and Larry earned the king’s crown this year (congratulations, Larry!). When he’s not snapping photos or raising money, Larry is always ready for a good chat. So I asked him to give us a little snapshot of his life and contributions to our beloved Key West and its “One Human Family” community. 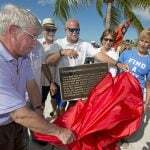 Keys Voices: How long have you lived in the Florida Keys? Larry Blackburn: (My wife Stephanie and I) have lived in Key West for 10 years. Key West has provided a wonderful atmosphere for life where, for the most part, things are the way that our world as a whole should be. 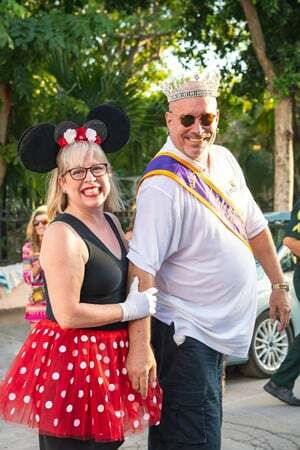 Larry and his wife Stephanie, shown here in festive attire, are deeply involved in giving back to the Key West community they love. KV: What are some aspects of our all-inclusive community that you admire? LB: It is simply the way that this community supports one another. KV: Your support for the LGBTQ community has been unwavering. Which programs and organizations are you involved with? LB: I am the current king of Fantasy Fest, president of the board of directors for the AIDS Memorial, and I have also worked closely with A.H. of Monroe County since my arrival. KV: What were some of the difficulties of raising money for the royal campaign while also working full time in your photography business? LB: I don’t find it difficult at all. I’ve always been very good at separating people from their money for worthwhile causes! 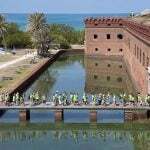 KV: Have you found that many Key West residents are devoted to helping local charities prosper? LB: Across the board, people open their hearts and wallets to help others. This giving attitude is one of the reasons our island is so attractive to people. People that don’t seem to have two nickels to rub together take their last $5 out and give it to someone in need at a fundraiser. KV: In addition to raising funds for nonprofits, you’re also an accomplished artist. Can you tell us a bit about your upcoming projects? LB: I have been invited to exhibit full-time at Frangipani Gallery, located at 1102 Duval St., which is quite an honor for me. I also have an exhibit at The Studios of Key West which runs Jan. 3-30, 2019. The exhibit is entitled “Dual Visions,” where multiple artists have been given one of my images on canvas and are adding their vision with their paints. The results have been phenomenal, and nothing like this has been done before in Key West. 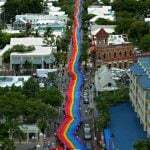 Click here to subscribe to the Florida Keys & Key West’s LGBTQ travel blog. Do You Believe in Santa Keys?